Indian River Senior Sammi Whelen takes control of the ball during IR’s game against Sussex Academy last week. Izzy Binko scored both goals for the Indians in their DIAA Division II state playoffs opener last Saturday against the Green Knights. Binko was able to find the back of the net for IR (11-5) in both halves. In the first half, the Indians freshman took a pass from Grace Engel and put it past Mt. Pleasant goalie Circe D’Ambrosio. Then in the second half, Sammy Whelen was credited with the helper to Binko — IR’s leading goal-scorer on the season. The win moved IR to the second round and a meeting with No. 3 seed Caravel Academy. That game was set to be played Thursday, May 24, after Coastal Point press time. For the result and highlights of the game, check out the Coastal Point sports Facebook and Twitter pages. Patrick Gogarty had the lowest round for the Indian River golf team as they participated in the Henlopen Conference championships at Dover’s Maple Dale Country Club. Gogarty’s 95 over the 18 holes was just shy of the required 91 score needed to qualify for the DIAA state championships. Joe D’Orazio carded a 98, while Mikaela Brosnahan and Isabel Wolfenbarger each shot 100. Luke Morgan and Zach Lingenfelter were four shots back of their teammates with a 104. It was the final scholastic match for seniors Brosnahan, D’Orazio and Wolfenbarger. “We did not have anyone qualify for states, but it was certainly a good year,” head coach Billy Wingate said of his squad’s 9-5 overall mark. Indian River junior Madison Galbreath was the lone tennis player — boys’ or girls’ — to make it to the DIAA tennis championships, after a solid 9-5 regular-season individual record. Galbreath faced Newark Charter’s Caroline Hall in the first round of the championships. She dropped the first set 6-2 before rallying to take the second set 7-5. In the third and decisive set, Galbreath just couldn’t get a break, falling 10-4 and getting eliminated. After an impressive opening-round 3-0 win over Concord School, the Indians met up with a Delmarva Christian High School that they had split wins with during the regular season. Despite their back-and-forth contests, the Indians (8-3) just couldn’t find the winning combination in the invitational tournament, falling in straight matches, 27-25, 25-20 and 25-21. Michael Barnes filled the stat sheet for IR with 16 kills, 11 digs, four blocks, an assist and an ace. Alexander Canseco Castro followed up with 24 assists, seven digs, a kill and an ace of his own. Mitch McGee chipped in with 11 kills, four digs and a block. IR was set to play Conrad on Wednesday, May 23, in a third-place consolation match at St. Mark’s School. The results and highlights from that match weren’t available as of Coastal Point press time but will be available on the Coastal Point sports Facebook and Twitter pages. Indian River Athletic Director Todd Fuhrmann confirmed this week that four spring sports teams were successful in winning Henlopen Conference South Division championships this season. The baseball team, which was set to begin its postseason run on Thursday, May 24, as the 16-seed in the DIAA playoffs, finished the regular season with an 11-7 overall mark. The softball squad, while seeing their season come to an unexpected halt in the first round of the DIAA playoffs, closed out their campaign at a solid 13-6. 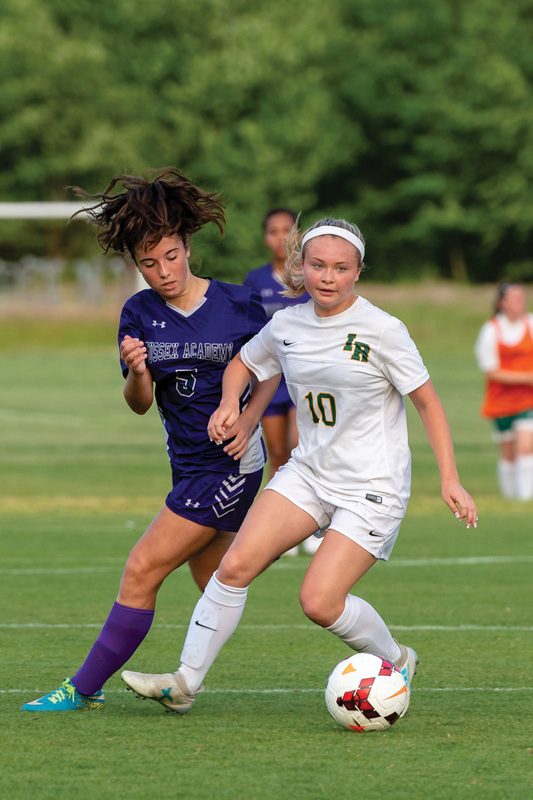 The girls’ soccer team was still participating in the DIAA championships as of press time on Wednesday, with a May 24 quarterfinals appearance set against Caravel Academy in Dover. Should they triumph in that match, the semifinals of the tournament are set for May 30, and the championship game on June 1 or 2. The Indians earned their division crown thanks to an 8-4 regular season. They lost the Henlopen Conference championship to Caesar Rodney 1-1 (4-3 on penalty kicks). Finally, the boys’ tennis team swept its five divisional opponents en route to the division title. Coach Mariano Woo’s squad had an extremely difficult non-conference and non-divisional schedule, which obviously more than prepared them for the regular season.